Researchers have been awarded £200,000 of taxpayers’ money to look into the impact of the Government’s controversial ‘Go Home’ AdVans aimed at illegal immigrants. The significant grant comes despite the high-profile billboard trucks drawing intense criticism from both Labour, the Liberal Democrats and UKIP. Yvette Cooper, shadow Home Secretary, attacked the advertising vehicles for using language borrowed from The National Front. Nick Clegg, Deputy Prime Minister, was vocal about his opposition of the campaign. Theresa May, the Home Secretary, announced that the Government would be dropping the scheme after acknowledging that advertising vans were “too much of a blunt instrument” in the fight against illegal immigration. 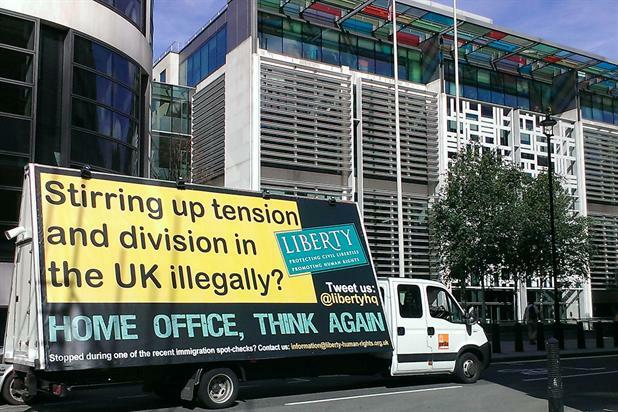 Civil liberties and human rights campaign group Liberty fought fire with fire and hired Gorilla Media to operate an ad van campaign to hit back at the Home Office’s anti-illegal immigration mobile billboard message. The 18-month research project, jointly led by the University of Glasgow and the University of Warwick, will attempt to assess the “wide-ranging impacts” of the scheme. Researchers from across the country will conduct interviews, organise large-scale surveys to work out how the campaign influenced community ties and public debate. “Understanding the impact of the ‘Go Home’ poster trucks and related campaigns is crucial,” said Dr Emma Jackson, a Glasgow academic who will help lead the research. The £200,000 research grant has come from the Economic and Social Research Council – a Government-funded body – and was one of the first projects to win funding under their “Urgency Grants Mechanism” initiative. A report into the scheme published last month found 125 illegal immigrants came forward after seeing the publicity, of whom 60 have already left the country. 11 people left specifically because of the ad vans.